The Backup Buddy Police Support app is designed to help with mental health issues. 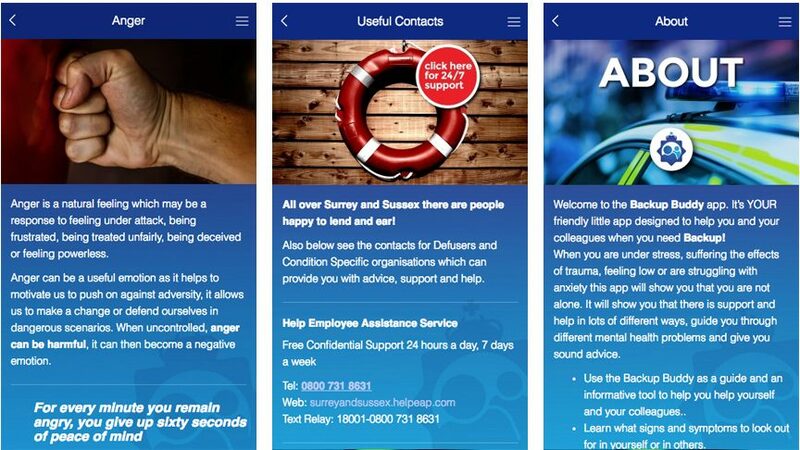 The App covers a range of problems faced by officers and staff in the Police Service, such as anxiety, anger, depression, stress, Post Traumatic Stress Disorder, eating disorders, self-harm and more. It gives practical advice and support on how officers can maintain good mental health, spot warning signs for themselves and others, plus advice on how to get help for themselves and colleagues. The App also includes officers’ own stories which users can relate to, leading to feeling less isolated. General mental health tips are provided, as well as a directory of Useful Contacts and we have a facility to share your story – to help reduce the stigma in others. 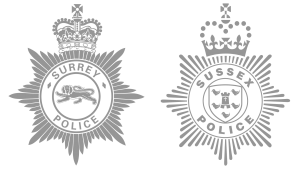 The App is currently available for Nottinghamshire, Bedfordshire, Cambridgeshire, Hertfordshire, South Yorkshire, Sussex and Surrey Police officers and staff, with further forces under development. There are specific pathways mapped for help and support within each force, including 24hr support for officers and staff. The app can be customised to reflect the unique identity of each (Police) Service. The information within can be tailored to suit every participating forces’ current pathways and protocols for officers seeking help. We want ‘Backup Buddy’ to be available to all officers in the UK, we want each Police Service to use the app to clearly signpost where their officers and staff can get help within their force 24 hours a day, from one easily accessible app. Backup Buddy is supported by it’s Facebook, Twitter and Instagram online presence. Our goal is to share stories and destroy stigma, where we can support each other and provide hope and guidance to anyone struggling with poor mental health… all to make a positive difference in policing. We were featured on national TV in Sept. 2018 with Channel 5 News, highlighting one officer Malcolm who due to the Back Buddy App gained the confidence to seek support for his PTSD – watch it here. It was because of the App, PC Malcolm realised he was not alone and other officers had gone through similar things. Also, co-creator Sgt. Garry Botterill (learn more about us) was interviewed for the item and it was extremely well received. It was a real milestone, not just for the App, but more importantly to get the Mental Health of our Police on national TV; reducing stigma even further. This is an extremely valuable resource and hopefully colleagues will take advantage of the support available. Fantastic app, fantastic support what else do you need. Easy to use with great info & stories you can relate to! Friends, Sgt. Garry Botterill and Judith Broug, both felt there was a real need to tackle the stigma of mental health injury within the Emergency Services – both are passionate about reducing stigma and came up with the idea of a mobile App, which they thought would be a great way to allow officers and staff to, in private and informally, find out more about the most common mental health issues they or their colleagues might face. The App is ‘their’ resource to find out how to look after themselves, their friends and most importantly where to access help when it’s needed. … you are not alone! We would like to thank those brave officers who shared their stories and who, by doing so, make it easier for others to seek support. 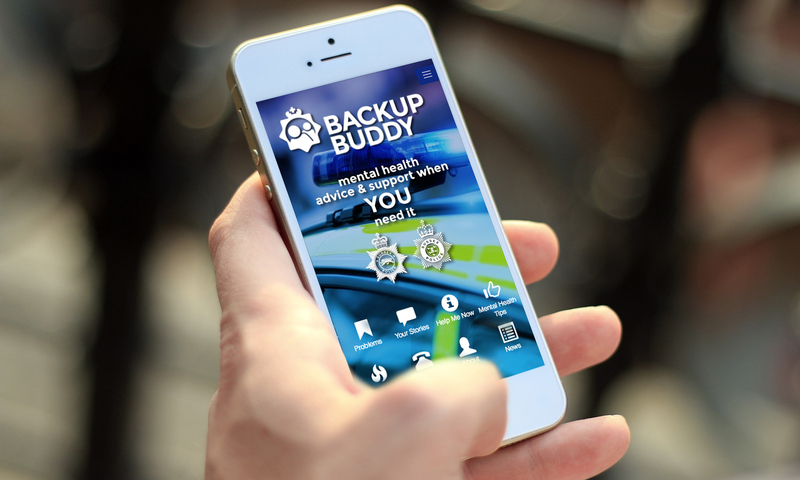 The first version of the Backup Buddy App was developed for Sussex and Surrey Police with the support of the Police Dependants’ Trust. The hope and ambition are that other forces provide Backup Buddy to their officers and staff, so they can support and recognise the need to reduce mental health stigma and make it easier for people to find much-needed support. If you are interested in providing Backup Buddy, customised to your force or service please contact us. Backup Buddy was developed, written and designed by G. Botterill (Sussex Police Sergeant) and Judith Broug (MissyRedBoots). Backup Buddy (app, site & others) is developed, designed and maintained by MissyRedBoots.com. Copyright 2019 - MissyRedBoots c/o Sound Culture Ltd & G. Botterill. Backup Buddy is a Trademark of MissyRedBoots c/o Sound Culture Ltd.